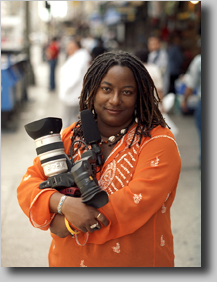 Lorna Green's love for filmmaking and story-telling is grounded in her experiences as a youth growing up in the projects of The Bronx. After a year with the Samuel Goldwyn Company in New York, she co-founded a New York-based production company, Young Brothers & Sisters, Inc., with a mission to provide resources for people of color to create their own films. Leaving her production company to do more independent work, Lorna has written and directed the documentary feature, BLOODLETTING: Life, Death, Healthcare, plus many award-winning narrative shorts, used widely by educators and youth advocates nationally and internationally. With an MFA in Communication and Film, her honors include several Gold and Silver CINDY Awards, the Gold Medal Questar Award, CINE's Golden Eagle, as well as Top 10% Finalist in the prestigious Nicholls Screenwriting Fellowship. As a middle school teacher, union organizer, and healthcare activist, Moore's venture into film production seemed a natural progression. "As in all my jobs, if you don't have it, or don't have the money to buy it, you figure out how to make it yourself." Living in Los Angeles because "that's the only city where I can do all my jobs at once," Moore claims her roots in Kansas, home of John Brown, and her spiritual home in Oakland, California, where she lived for sixteen years. 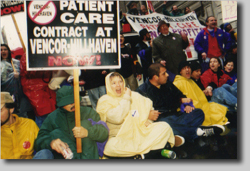 Raahi Reddy, a veteran labor organizer, has organized in hospitals and nursing homes in many states throughout the nation. Her international solidarity efforts reach to Asia, where she has traveled to China and South Korea to learn about their trade union movements. A graduate of San Diego State University, with a Bachelor of Visual Arts & Media, Chris Peterson has edited numerous shorts, documentaries, and broadcast television shows such as The Bachelor and 10 Things Every Guy Should Experience on Spike TV. A graduate from AFI, with an MFA in Film Editing, Darianna Cardilli's editing credits include: AMC's Hollywood Fashion Machine Series, for which she cut Hitchcock and the Fashions of Fear, Studio Style Wars, and Hollywood 101. Features include Hollywood 5, Hammerlock (2000), and Frozen Stars Real Life Private Investigators. Donors & Supporters: Without these generous people, this documentary would never have happened! Thank you! Erin Scotto ~ Patrick Coleman ~ Mayee Crispin ~ Kimble McCann ~ Ian & Ginger Cameron ~ Brian Olney ~ Danielle Mahones ~ and many more! donated medical supplies to the people of Cuba.